Rye is a grain used as a staple food, as well as animal feed. Rye flour is often used in sourdough bread, and in fact the gluten in rye requires the acids of a sourdough ferment to develop the gumminess needed to help rye bread rise properly. 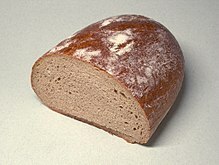 A prominent sourdough rye bread is called pumpernickel. Rye is not gluten free. Whilst it does not have the same form of gluten much loved by bread bakers, it has a protein called secalin which is also harmful to people sensitive to gluten, including those with coeliac disease. This page was last edited on 24 April 2010, at 23:02.